In addition, do not place front-facing child restraint in the front passenger’s seat either. 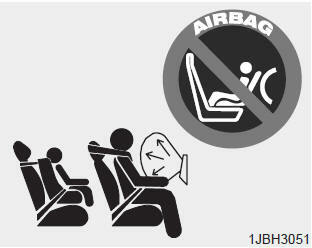 If the front passenger air bag inflates, it would cause serious or fatal injuries to the child. Extreme Hazard! Do not use a rearward facing child restraint on a seat protected by an air bag in front of it! Never put a child restraint in the front passenger’s seat. If the front passenger air bag inflates, it can cause serious or fatal injuries. When children are seated in the rear outboard seats of a vehicle equipped with side and/or curtain air bags, be sure to install the child restraint system as far away from the door side as possible, and securely lock the child restraint system in position. Inflation of side and/or curtain air bags could cause serious injury or death to an infant or child.